It’s funny, but often in life, things can completely pass you by. Very occasionally, something will appear, slightly out of context and place to catch you off guard. This was definitely true for me just lately and although rather taken by surprise, it developed into an extremely rewarding and very worthwhile experience. For a long while now, I’ve been firmly rooted in my own mindset, that I’ve explored and enjoyed all the flatfish options that the awe-inspiring mixed fisheries of the U.K. can offer us and can go no further. Not so the case. 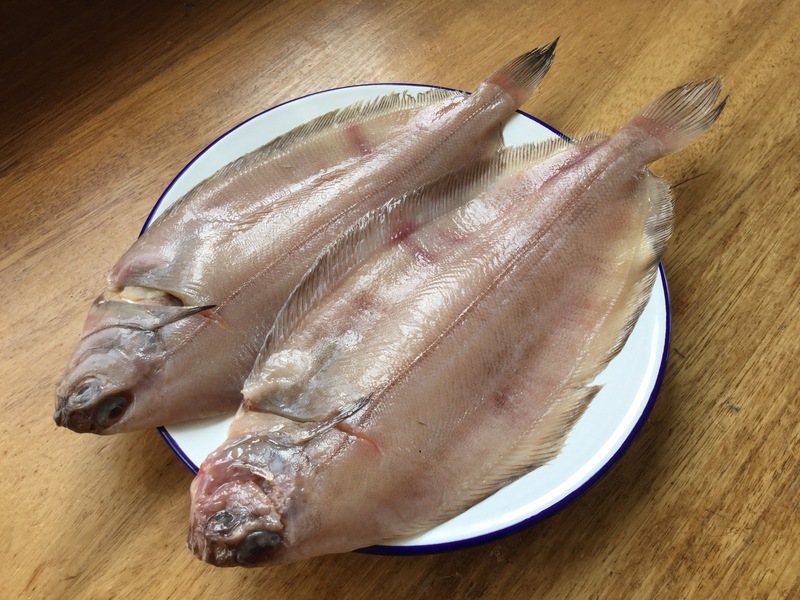 Only recently, on a mission to procure the first of the peak condition lemon soles that are now being landed in abundance on the South Coast, I happened to spy, amongst the mesmerising array of plaice, brill, turbot and Dovers, a fish which not only caught my eye, but made me look twice. A smaller megrimesque specimen, with an understated, but incredibly alluring and delicate translucence to the skin. I gestured to Chris, who’d instantly twigged what had occurred, to extract one from the beautifully crafted display and furnish me with an explanation. Looking somewhat similar, I had in my own mind, convinced myself it was a indeed a megrim or whiff. A rather poor and underrated sole-cousin of the Dover, the sand, and the lemon, but still caught in great number all around the coast in the slightly deeper water, as a predominant but exportable bycatch. A beautifully flavoured and genuine alternative to the regular flatty staples, gaining a little more popularity recently through initiatives such as the NFFO’s recent “Deck to Dinner” project. However, it was not. Examining the fish further, I could see, on much closer inspection, it lacked the curve of the whiff and although indeed remarkably similar in many respects, stood out as a species apart, sporting an amalgum of traits, blended together to produce what I considered to be a worthy hybrid of a dab and a Dover. Of course, I was aware of the witch. During those countless youthful hours of studying my many, concise tomes of British sealife, it had been logged very definitely, in my piscatorial library, but now when faced with a prime and glistening example, unexpectedly glimpsed, I’d failed to recall it. Caught, like the megrim, mainly offshore in the shelf fisheries of the South West and further North too, amongst the Scottish white fish fleet, witches are landed regularly and in number than affords them market status but far less culinary appeal than their far more respected and commercial counterparts. Right-eyed too, which should have given the game away, had I been on my mettle, but by now, my fleeting ignorance had got the better of me as Chris duly informed me of its identity. 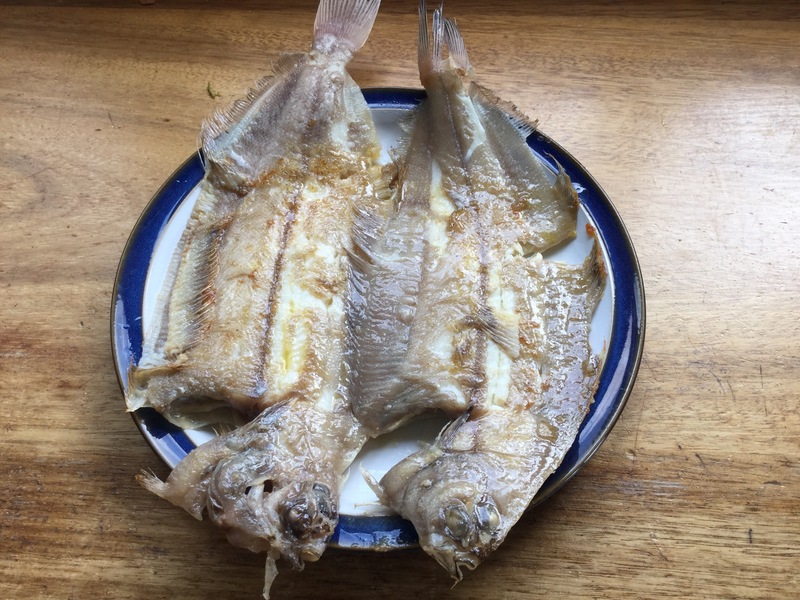 Sourced from Brixham, two of these delightful fish were soon on the scales and in a typically characteristic and generous gesture, I’d been commended to sample them and relay my thoughts and tasting notes for future reference. Rather excited at this point and having almost forgotten the main purpose of my visit, I quickly picked out the superb lemons, that had been the subject of the day’s menu request and vouched to relay my thoughts in short order, once home. I can report that, with a high degree of confidence, within forty minutes of spying the clutch of witches on the Friday Street slab, my two were in the pan and gently sautéing in a generous pool of nutty butter. There’s not much more to relay here, suffice to say 2 minutes either side were ample and when given fish of this provenance and character, simplicity has to be the key, with minimal fuss. No sauce, no accompaniments, no steaming bowl of frites, not even a squeeze of citrus. Just the witches, their buttery coating, a fork and a plate. I found the meat light and open, lacking the Dover density, but still with an exquisite flavour. Like our local dabs when served on the bone, fish of this quality when only-just-cooked, are worthy of any table and to my my mind deserve huge respect, just as do the guys who strive to land them. Whenever I eat perfectly fresh fish, I’m invariably delighted. But on this occasion the delight was accentuated by something different. A rounded and eminently gratifying sense of not just satisfaction but excitement. Excitement that I’d inadvertently stumbled upon a fish that combines the flavour and delicacy of the premium flatfish with an affordability and an economy that suits all budgets. A undoubted substitute for Dover and lemon sole indeed, but also plaice, considering its texture. It just needs a bit of PR! I shall be hunting down witches again. I hereby dub you the Witchfinder General (although of course you are a much nicer person than the original). How lovely to find a ‘new’ and unexpected fish and one that brought such pleasure on eating. Thanks Linda! It was just one of those moments. Good on you for flagging it up. If people don’t know about them, they won’t ask their fishmonger and the fishmonger won’t stock them. Love dabs, love the witch. Simple is best, as usual. Lovely stuff. Thanks Nicola. I thought you’d enjoy!